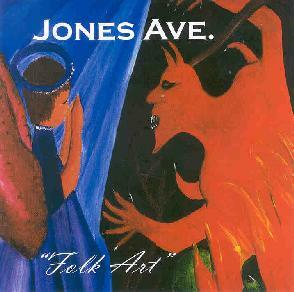 Jones Ave - "Folk Art"
Jones Ave is a Georgia based band that alternate between jamming acid psychedelia and folk songs. The band consists of Brian Fowler on guitar, mandolin, bass, Rhodes, congas and vocals, John Joiner on flutes, bass and keyboards, Master Gabe Holland on keyboards, Dr David Wisdo on acoustic guitar, bass and vocals, Laszlo Stan on violin, and Jota Parker on drums. On the acid space rock side my favorite tracks are "Treadmill" and "Circus Clown". "Treadmill" is an excellent jam tune with slowly soloing stoner acid guitar and a beautiful violin and flute combination. Laszlo Stan's violin is the real highlight, rising to screaming peaks and then slowly falling again. Like a combination of Bevis Frond and Hawkwind. Killer psychedelia that combines a raw jamming style with a more cosmic space rock sound. "Circus Clown" is even more in the Bevis Frond domain being a total acid psych guitar freakout tune, but with the addition of Laszlo Stan's violin peppering the music in a quirky style and spoken word taking the place of singing. "Atlantis" features singing violin leads along with strumming acoustic guitar, and a spacey synth line and slowing soloing guitar gives the music an underlying trippy feel. "Mcveigh" is a dark and intense metallic acid-psych tune, which is appropriate given that Timothy McVeigh is the subject of the lyrics. The rest of the songs are in the folk realm, though elements of psychedelia and even prog rock are apparent. What makes the music so enjoyable and gives Jones Ave their character is the violin (a key instrument throughout the album), mandolin and flute, which adds an ethnic or traditional flavor to the songs. My favorite from this style of tunes is "World War 3" with it's lyrics and news samples of conflict in the Middle East that create a haunting aura around the song. Overall an impressive album that could appeal to a diversity of tastes. And poking around their web site it looks like Brian Fowler is involved in a number of tasty looking projects. For more information you can visit Jones Ave at the San Francisco Blue web site at: http://www.sfblue.co.uk/.